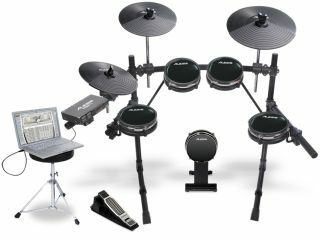 PRESS RELEASE: Alesis, a leading manufacturer of professional audio equipment and studio electronics, announces the USB Studio Drum Kit, an electronic drum set for recording and programming with software on computers. Alesis will unveil the USB Studio Drum Kit at the 2010 Winter NAMM Show in Anaheim, CA, booth 6400, January 14-17. The USB Studio Drum Kit is designed for USB/MIDI performance with software on a Mac or PC and can also be used as a controller for virtually any hardware MIDI device such as drum modules, samplers, synth modules and more. The USB Studio Drum Kit features dual-zone RealHead 8-inch Pads, low-noise DMPad Cymbals, and a compact, studio-friendly StealthRack drum rack. Drummers and studio owners simply plug the kit's Trigger|iO interface into their Mac or PC's USB port, load sequencing, recording or virtual instrument software and they're ready to track. The USB Studio Drum Kit is MIDI compatible, which allows drummers to have the ability to track a performance and go back afterward to tweak sounds. The USB Studio Drum Kit also opens up a new world of virtual drum-module software including BFD, Toontrack and Reason to drummers and producers looking for realistic drum performances without the hassle of setting up microphones or the cost of maintaining a large drum-tracking room in their studio. The USB Studio Drum Kit's acoustic-feeling RealHead drum pads are built around 8" mylar drumheads and acoustic-dampening foam for quiet response. The snare and tom pads are dual-zone, enabling rimshot or rim-click sounds on the snare and additional sounds such as wind chimes, cymbals, gongs, and cowbells on the tom rims. The tension-adjustable drumheads can be replaced with any model from any manufacturer drummers prefer. The triple-flanged counterhoops are covered in removable, sound-reducing rubber sleeves, which further cut acoustic noise. The USB Studio Drum Kit includes a self-standing RealHead Kick Pad, to which any model of single or double-bass-drum pedal can be attached. The kick pad also features a tunable, 8" mylar playing surface. The USB Studio Drum Kit comes with DMPad Cymbals with low-noise rubber playing surfaces. The kit comes with a DMPad 12" Hi-Hat Cymbal, a DMPad 12" Crash Cymbal, and a triple-zone-compatible DMPad 14" Ride Cymbal. The Crash and Ride feature large choke strips on the undersides for accurate cymbal control. The Ride also features multiple-zone triggering on the bell, face and edge. The Hi-Hat Cymbal is continuously controllable using the included RealHat Pedal. The fully adjustable, compact StealthRack is built of 1-1/2-inch metal tubing, which is standard throughout the drum industry. It's easy to expand the USB Studio Drum Kit with any manufacturer's clamps and mounts. All necessary clamps, professional 1/4-inch cables, and mounting hardware are included. All clamps adjust with the included drum key. Pad-mounting L-arms feature non-round arms to eliminate slippage from playing. All of the hardware on the USB Studio Drum Kit is designed for sure grip and extensive adjustability. "The USB Studio Drum Kit is the perfect tracking drum set for computer-based studios," said Jim Norman, Product Manager, Alesis. "Forget placing mics, tuning drums, setting up bass traps - just plug in and play!" The USB Studio Drum Kit will be available from musical instrument and professional audio retailers in March 2010.